EAR Yoshino V12 review | What Hi-Fi? We like to take our time when reviewing kit. A review can take anything from a couple of days to a number of weeks depending on the type of product and complexity of what we’re testing. Sometimes, though – very rarely, it has to be said – it can take mere moments to know that we’re dealing with something special. So it was with EAR Yoshino’s V12 valve integrated stereo amplifier. Within just a few seconds of listening to Beethoven’s beautiful Moonlight Sonata we were hooked. This remarkable machine delivers all the delicacy, refinement and detail we would expect from a valve-powered integrated amp selling at this elevated price, but also dynamic solidity and a grip on the lowest frequencies that just isn’t normal for a product of this type. Taken aback a little, we then started searching out more dynamically demanding recordings. The likes of Massive Attack’s Angel and Watch The World Burn from Hans Zimmer are the kinds of recordings that have most amps, valve or otherwise, struggling to convey the waves of seismic bass with any verve or definition. Most valve designs simply give up, delivering a soft, overly rich mess of low frequencies that simply drone on underneath the rest of the music. Not here. The V12 confounded our expectations by sounding taut, fast and rhythmic. There’s real drive to the sound and a sense of momentum to fast-moving rhythms that’s a match for the best amplifiers at this sort of price, regardless of the technology used to make them work. And the good news doesn’t stop there. Alongside all that composed organisation and unusual muscularity, the EAR Yoshino V12 doesn’t neglect the traditional virtues of valve amps either. This amplifier has a refined, nicely rounded tonality that sounds pretty convincing to us whether it’s rendering a piano or Adele belting out Rolling in the Deep. There’s little sense of the subliminal mechanical hardness that many transistor-based designs still have, or the brightly-lit edges many produce to emphasise detail. 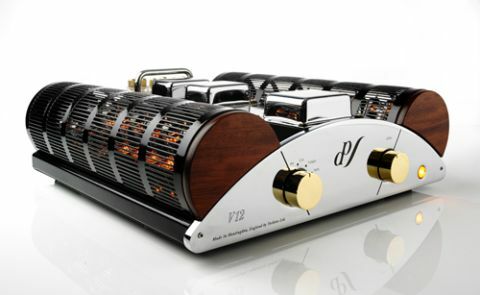 That said, the V12 still has real bite to its sound (when the music demands), so listeners who want to bathe in the warm glow of the typical valve sound might not find this amp totally to their liking. They will like the amplifier’s sonic stability, though, and its ability to deliver harsh recordings without overplaying any of the material’s shortcomings. Usually, amplifiers with the resolution and insight of the V12 have the habit of highlighting the flaws in every recording that comes their way. The EAR Yoshino just isn’t like that. It isn’t overly fussy about partnering equipment, either. Like most valve amplifiers there’s a choice of speaker outputs. These are marked for four- and eight-ohm speakers, and are there to better electrically match the amplifier’s output to the speakers used. The variable nature of a speaker’s impedance means that the matching can never be precise, but just connect to the set of terminals that comes closest to your speaker’s nominal impedance and the results should be fine. Don’t be afraid to experiment, though: once you’ve listened to a variety of music through each connection, simply trust your own judgement and use the outputs that sound the best to you. We tried a range of speakers, from our reference ATC SCM50s to KEF’s LS50s and finally Quad’s 2812 electrostatics, and obtained admirable results all round – within the loudness and dynamic limitations placed by the V12’s 50W-per-channel output, of course. All the combinations we auditioned brought a smile to our face, but the V12 and the Quads combine quite brilliantly – the pairing delivers some of the finest sounds we’ve heard in years. That’s saying something considering the calibre and price of the kit that we tend to review in the Temptations section of the magazine, where this review originally appeared. The choice of source components should pose no undue problems for V12 owners, provided they’re good enough to do justice to an amplifier as capable as this one. For most of the test we used our reference Naim NDS/555ps streamer and Clearaudio Innovation Wood turntable package (partnering Graham Slee’s ERA Gold/ Elevator EXP phono stage) with great results. The Parasound CD 1 CD player put in an admirable shift too. It comes as no surprise that this valve amplifier is firmly in the minimalist camp as far as features are concerned – such products rarely come stacked with features, and so it is here. Despite one of the inputs being labelled ‘phono’ this is very much a line-level-only device. It can accommodate five line-level sources, and has just a single tape loop. Not overly endowed, then, but enough for the kinds of systems that such an amplifier is likely to find itself in. The lack of a remote control will probably be more of a concern for some people than any input limitations. Still, the main controls feel pleasingly solid and precise in use, and there’s something genuinely nice about having such a simple control layout. Pick your source, set the volume and off you go. The whole amplifier feels very well made. It’s obviously the product of a small company so we wouldn’t expect the finish to have the slickness of, say, an Apple product – but by high-end standards there’s little to complain about here: the casework feels solid and every section, from the nicely chromed front panel to the curved cages over the array of 22 valves, suggests quality. The V12’s circuit design is unusual. It uses six EL34 valves per channel, with three connected in parallel for each half of the push/pull output. These output valves are fed from a preamp section that uses the well-proven ECC83 valve. The world is far from short of high-end amplifiers, but we think the EAR Yoshino V12 is something rather special. It has the refinement, insight and delicacy expected from a top-class valve design, but couples it with a sense of attack and drive that just isn’t. It would be doing this amplifier a disservice to describe it as simply an excellent example of the valve design. It’s a great amplifier. Period.